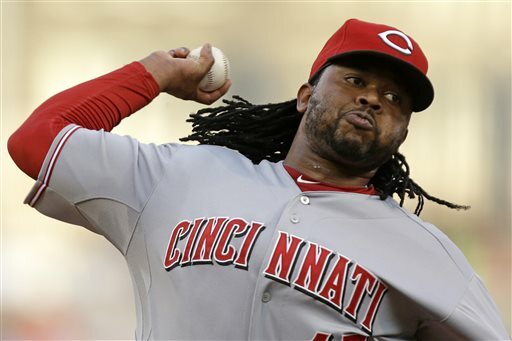 With one of the most dominant starts in all of baseball this season, Cincinnati Reds right-hander Johnny Cueto eased concerns from major league clubs interested in acquiring his services as the trade deadline nears. On Tuesday, the 29-year-old Dominican Republic native silenced the Washington Nationals by tossing a complete game, two-hit shutout with 11 strikeouts and one walk. He threw 122 pitches in Cincinnati’s 5-0 win and retired 17 of the final 18 batters he faced. The stellar performance could have been Cueto’s last with the Reds, the team with which he has spent his entire eight-year big league career. After missing one start last month due to elbow soreness and having another start pushed back, Cueto made an emphatic statement to contenders looking for a staff ace by the July 31 non-waiver trade deadline. He improved to 6-5 with a 2.61 ERA, a 0.87 WHIP and a 5.29 strikeout-to-walk ratio over 16 starts and 113.2 innings. The list of Cueto’s suitors is long. Among the clubs that could pursue a trade include the Los Angeles Dodgers, the Houston Astros, the Toronto Blue Jays and the New York Yankees. The Boston Red Sox have the depth and talent in their farm system to entice the Reds, but earlier this week Boston GM Ben Cherington told reporters that the club is interested in young starters and relievers who are under team control beyond this season. Cueto will enter free agency at season’s end and will undoubtedly command a long-term deal that will match or exceed what Jon Lester and Max Scherzer signed last offseason. Since he will become a free agent in the offseason, likely the cost in terms of prospects and/or young major leaguers in a deadline transaction with the Reds will be less than for Cueto what it will take to land Phillies left-hander Cole Hamels, who is signed through 2018. Yet trading Cueto will reap a bounty of players for the Reds, a team that is rebuilding. Reds GM Walt Jocketty is stuck with Joey Votto‘s long and expensive contract, and right-hander Homer Bailey is recovering from Tommy John surgery in the midst of a $105 million deal. That means names like Cueto, right-handed starter Mike Leake and uber closer Aroldis Chapman could be on the move along with outfielder Marlon Byrd and right-handed reliever Manny Parra.